Willpower is a powerful tool in each of our hands that can help us achieve our goals. I've always been intrigued by how willpower works and have been reading up on a few behavioral psychology books/articles/blogs. Willpower is a limited resource and it gets depleted with each decision we take. 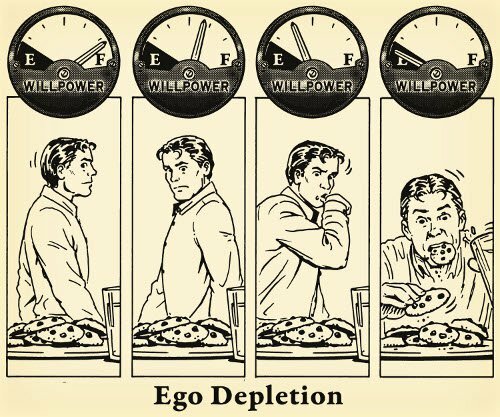 Ego depletion refers to the idea that self-control or willpower draw upon a limited pool of mental resources that can be used up. When the energy for mental activity is low, self-control is typically impaired, which would be considered a state of ego depletion. I visualize it this way. Imagine a "pot" of willpower that gets refilled every morning, as you wake up. You get the drift? At the end of the day, the reserves are almost depleted and we tend to make wrong decisions with limited willpower in hand. That's the reason why it is better to finish the exercise routine first thing in the morning or go for brunch/lunch with friends where you can refrain from unhealthy food choices rather than late-night dinner when the reserves are too low. The best part about this "pot" of willpower is that the more you withdraw from it, the size of the pot grows. As you keep saying Yes to positive habits and No to addictions, the pot of willpower keeps growing in size. On the contrary, if there are no withdrawals and you succumb to your temptations (snuggling up inside the cozy blanket till 8 AM and skipping the morning walk, going for a second serving of the juicy gulab jamun at the office cafeteria or grabbing that 6th cup of tea just because it has been a tiring day so far), the size of the pot shrinks. Your willpower reserves go down faster. The basic supply-and-demand principle applies to willpower too. The more the demand for willpower, the more the supply of reserves from your subconscious (and vice-versa). I'm not sure about scientific backing of this explanation but personally, this makes a lot of sense to me. Looking at it from another angle, what we tell ourselves (thoughts) and how we end up behaving (actions) need to be in sync. It builds up self-trust and self-confidence. If our thoughts and actions are repeatedly out of sync, then we lose trust in ourselves, we fail to take up new commitments or avoid saying Yes to opportunities where there's no absolute clarity. The more our thoughts and actions are in sync, the more our willpower reserves are. The perfect example of this principle is that once you start exercising for 2-3 months consistently, your chances of bunking goes down. What's your understanding of willpower? How do you use it? Where do you most succeed / fail? Do share your comments.